Known for its blue-ribbon trout fishery, the Big Hole flows undammed for 150 miles. The river is home to the last native, self-sustaining population of fluvial Arctic grayling in the lower forty-eight states, as well as a dwindling population of native westslope cutthroat. "The social and economic mainstay of the Big Hole valley has traditionally been ranching, which relies heavily on the river and tributaries for irrigation. Resource issues in the watershed include de-watering of the river by irrigation, loss of habitat to residential development, grazing management, noxious weeds, and the decline of the fluvial Arctic grayling. We are working to develop science-based conservation strategies that will protect this magnificent resource, and enhance critical habitat for native trout, grayling, and a multitude of other species. We are launching new conservation strategies; helping to identify and implement restoration projects along the river; educating landowners through workshops about ways they can do their part to improve water quality and habitat conditions in key riparian zones; and pursuing conservation easement partnerships." its unique culture, fish and wildlife. The Big Hole River Foundation was founded in 1988 by noted Montana conservationist, angler, and fly tier George F. Grant. The foundation is a nonprofit conservation organization dedicated to defending and conserving the natural and cultural resources of the Big Hole watershed. Projects and programs are supported by diverse interests. The foundation works closely with local, state, and federal agencies, as well as sportsmen organizations and conservationists. The foundation funds its projects through membership dues, donations, government grants, and private foundations. The Big Hole River Foundation's actions reflect collaboration, forthrightness, inclusiveness, fairness, accountability and informed decision making. The foundation recognizes the uninterrupted connection of the elements of the valley's people, creatures, plants and geology. Members of the foundation act with care and humility as they consider the beauty of this closely integrated environment. The River Ambassador Program was initiated to showcase the outstanding guides and outfitters who work and live in the Big Hole River basin. Guides and outfitters constantly demonstrate an exemplary attitude toward conservation and spend countless hours helping people understand the importance of conserving and protecting our precious resources. This attitude supports the mission of the Big Hole River Foundation. 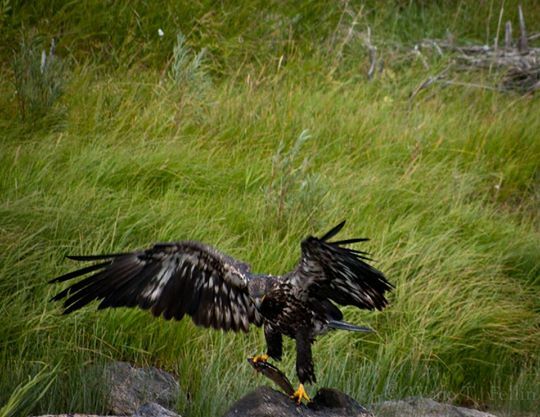 Guides and outfitters are in a unique position to substantially influence public perception of the Big Hole River and the philosophy of conservation and care. When clients new to the area spend a day with a guide on the river, they have a unique opportunity to educate them about angling ethics, conservation principles, and the history and culture of the Big Hole River and southwest Montana. When those clients return to fish each year, guides have the opportunity to reinforce these values and lessons, plus educate clients on changes in the watershed and regulations that govern the use of the Big Hole River. Since guide's actions and words directly impact the actions and attitudes of the public they are often emulated. We believe a core community of guides espousing the Basic Principles can influence anglers to thoughtful behavior that conserves the Big Hole River. Guides are on the river every day and can help the Foundation serve as its eyes and ears. We appreciate the guides alerting us to developing issues, observations and suggestions for the Foundation. We are respectfully seeking support of our operations budget and projects. Securing operating funds allows our staff to move forward with two important initiatives that help accomplish our mission and would make for a stronger partnership in the conservation and restoration of the Big Hole River valley. - Easement Program: identifies landowners willing to permanently protect the most critical aquatic and associated habitats of the Big Hole River valley. -Restoration Program: identifies landowners willing to restore and enhance the aquatic and associated habitats on their property in the Big Hole valley (our initial goal is three landowners). -Stewardship Fencing Project: construct and maintain lay-down fencing along critical sections of the river to reduce intense grazing pressure along sensitive river banks promoting bank stabilization and maintain healthy channel geometry. -Pennington Bank Stabilization Project: This project includes survey and design, re-contouring of the degraded bank, and vegetation plantings. 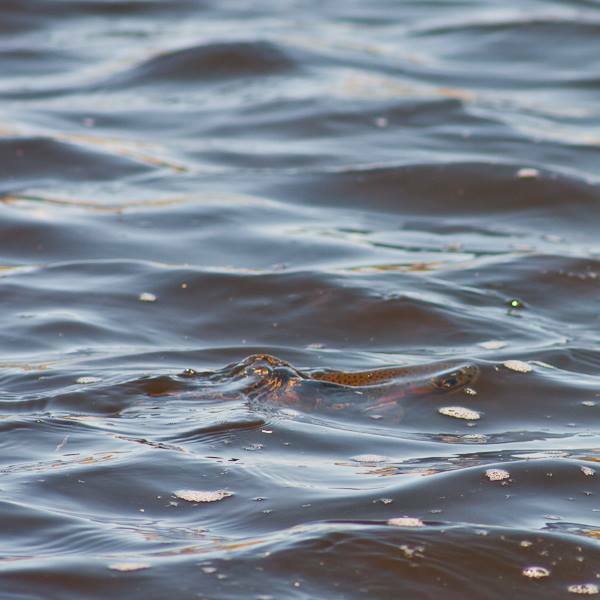 -a benthic macroinvertebrate (BMI) study is assessing if aquatic insect communities are correlated with observed seasonal grayling distributions. -fish tagging study, implemented during fall 2009, which will help assess effects of competition and predation by trout on fluvial Arctic grayling populations. -Watershed Education Program will instill a clear understanding of basic environmental science fundamentals in students and teachers by using a place-based, hands-on field and classroom curriculum. Our initial goal is to teach at least 70 students and obtain active participation from at least one teacher from each of the seven rural public schools in the Big Hole basin. -Outreach Program includes the River Ambassador Program and the production and distribution of our Technical Guidance Series and Watershed Sourcebook. Our current operations budget averages $4,000 per month. As such, we need to raise nearly $50,000 per year, which will allow us to annually deliver the above described activities in the Big Hole watershed. 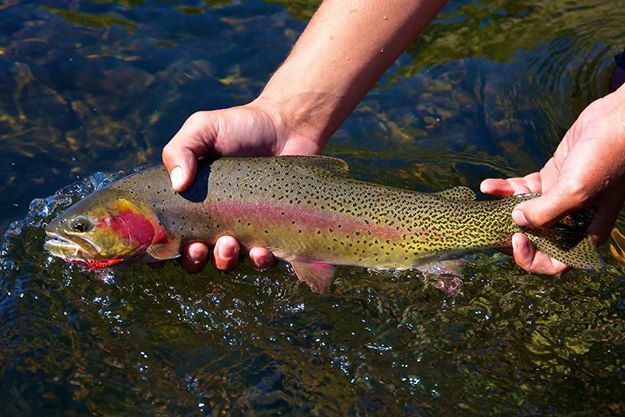 It’s spawning time for our cutthroat and rainbows, watch your step! throughout Montana but their numbers are rapidly declining due to hybridization with rainbows and degradation of habitat. More and more fisherman are catching cut-bows and fewer and fewer anglers are catching true cutthroat. 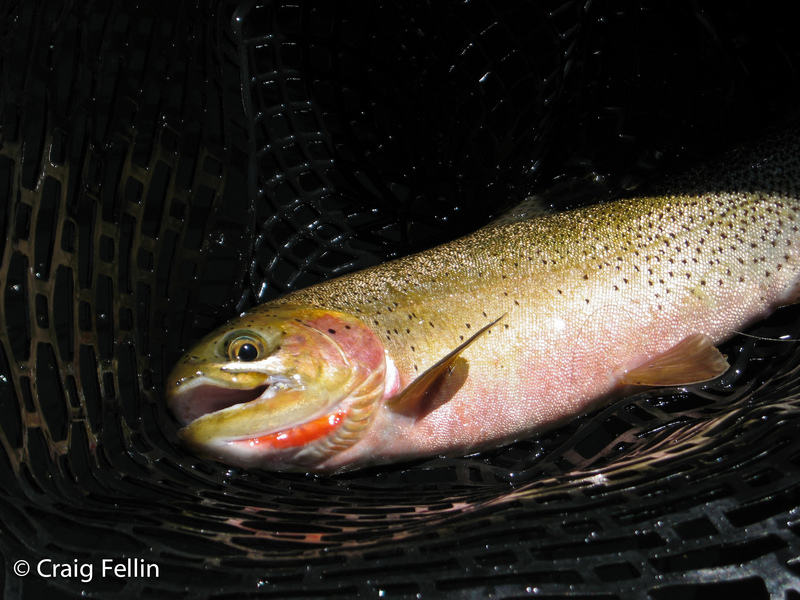 The native Westslope cutthroat is dying out due to warmer temperatures, erosion, and increased angler presence. In order to help preserve the next generation of trout in Montana, please avoid stepping on redds this spring! 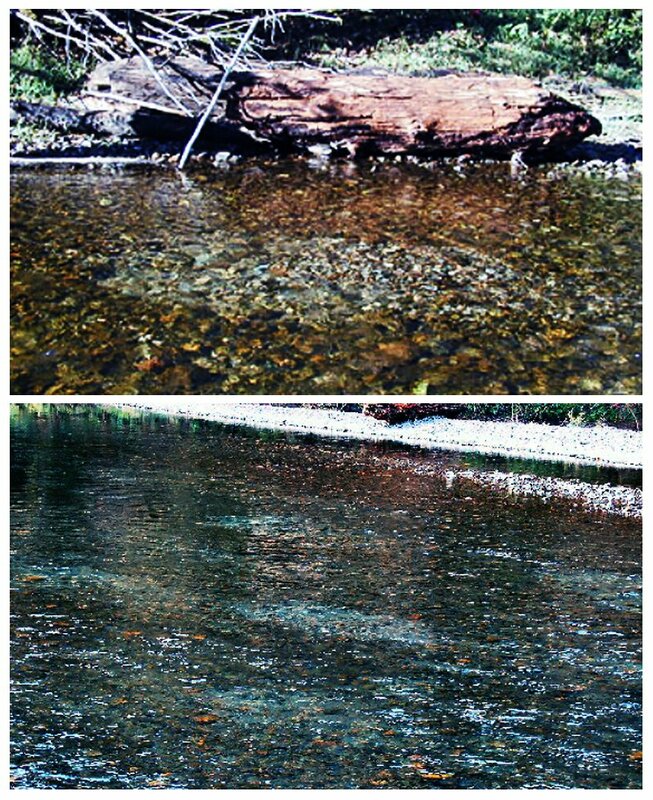 Cutthroat and Rainbow spawn in the spring in clean gravel beds, usually in swift moving water. They bury their eggs in a nest called a redd where they will grow for the next four to seven weeks. The fry will remain under the gravel for a week or two after they hatch and will still be very vulnerable. Redds are oval patches of gravel about three feet wide in one to three feet of water. They can be identified clearly by the gravel color which is lighter than the surrounding riverbed. Inconsistent mounds and depressions in the redd site indicate nests. Redds are typically on gravel bars near islands or in below riffles where clean water can flow over them. 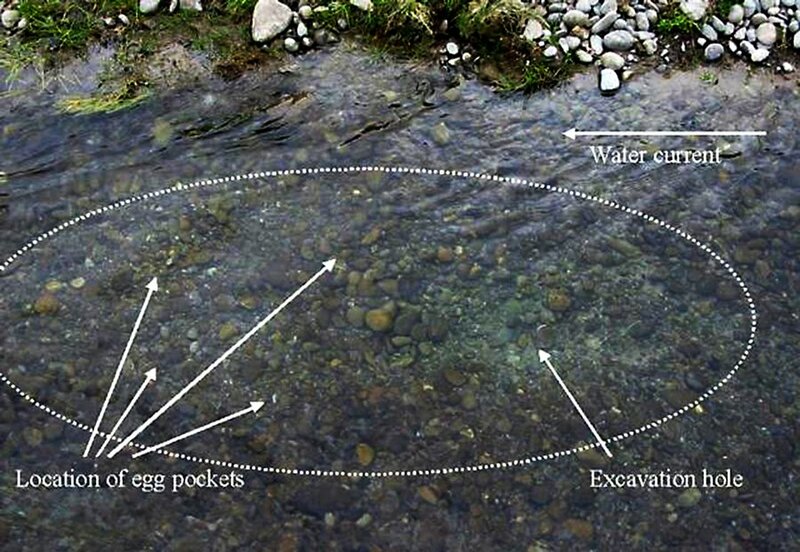 Do not walk directly upstream of a redd because the eggs need clean water. Do not walk on a redd because you will crush the eggs or fry. Avoid shallow gravel bars and keep your eyes open. 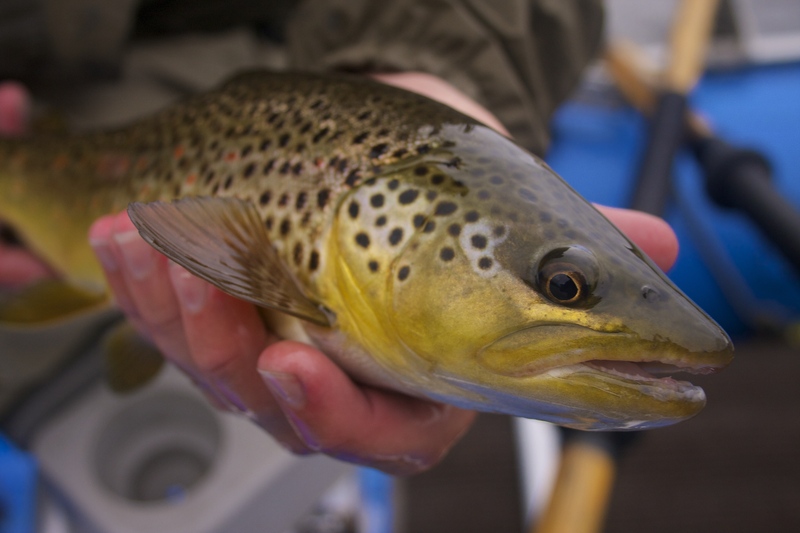 Don't overpressure spawning trout either, if a fish is acting odd and seems to be protecting an area, leave it alone. She’s exhausted and not in the mood to play! Spawning bows and cuts will appear darker than normal, with more vibrant belly colors. They will often appear sluggish because they have expended most of their energy on spawning. They need all the help they can get, so once again, tread carefully!